You want to write. You want to write. for coasts. Midnight, the usual sounds. the stories reach you. He can’t come back. left them under the beds of women. When does your life stop being your life? The trains, the air—nothing’s a distraction. 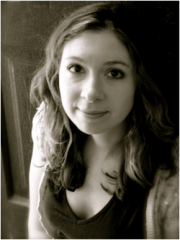 Alison Stine is the author of two books of poems, Ohio Violence, winner of the Vassar Miller Prize (University of North Texas Press, 2009), and, forthcoming in Spring 2011, Wait, winner of the Brittingham Prize (University of Wisconsin Press). She is currently working on a children’s novel.